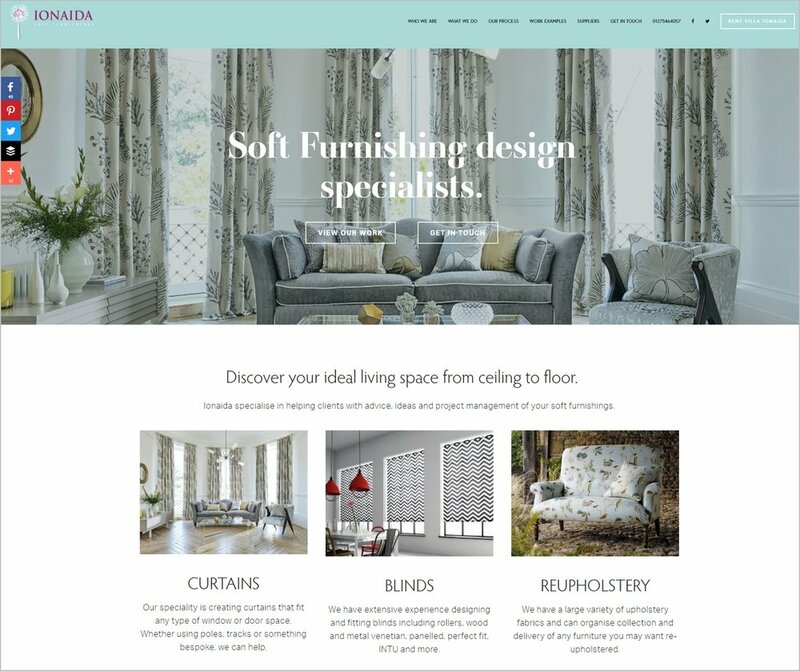 Ionaida are a soft furnishings design company with a lot to shout about, but their old website was not doing their service justice at all. Cherry Websites were asked to look at creating an entirely new website which would reflect their services and allow them to easily display their latest work. The logo was the starting point for this project as it had been well designed and contained hints of design and colour that could be carried through the whole site. The client unearthed vast amounts of case study photos, and the gallery was created to showcase this work. We created a 'before and after' gallery, as well as client case studies so customers could get a good idea of the services available. The navigation was streamlined, and the copy refined so that customers were clear about the services available, costs involved and process to get from enquiry through to project completion. Plenty of suppliers offered their own images so we didn't have to rely on stock, and the fabrics and finishes shown were true to life. Using the Squarespace functionality, the site was built responsively so it adapts to all screen sizes. We set up a new email address which the enquiry form plugs straight into, and connected to existing and newly created Social Media sites. We implemented our standard SEO which allowed the site to be found from search terms 'Interior Designer' in the local area, as well as sitemap generation and meta tag use to amplify the site's eventual search engine presence. The Squarespace site's intuitive back end means with some training the client is now able to update case studies regularly and even make overall changes to the site without the need for further development.